The analogy I came up with that best describes Trine 2’s lack of effort involves another set of physics-based puzzlers: the Portal games. Portal was a fine game, but one which carries the reputation it does because it was so unexpected. It breaks ground for the basic portal concept but also carries it just about as far as it can go in the space of one short game. Portal 2 is also a fine game, but it is not the same game. It adds many new puzzle mechanisms – gels, light bridges, gravity beams, lasers, aerial faith plates – all of which opened up new possibilities for the portal-based gameplay. If it had just been Portal all over again with slightly shinier graphics it would have rightly been pilloried because even though the basic concept is a strong and imaginative one, it’s nowhere near strong and imaginative enough to support two full games all on its own. Portal 2 needed that extra spice to keep the player guessing, to keep their mind working, and to stop them from getting bored. Now, ask yourself how strong and imaginative the concept of stacking boxes and planks on top of each other sounds. Can it support another full game? If your answer is yes, I congratulate you on your recent pre-frontal lobotomy. If your answer is no, you’ll understand why I think Trine 2 is a pretty bad game. It doesn’t do anything new. The game isn’t completely devoid of new gameplay elements, mind. There are liquids that need to be guided away from/towards a target and airflows that must be redirected with pipes, and these could have added at least some of the variety that Trine 2 so badly needs. Unfortunately the game doesn’t do anything with them. Once you’ve played one pipe-rearranging puzzle you’ve played them all. Making plants grow with water lasted a little longer, but I was sick of that mechanism as well by the third or fourth time I encountered it. The pipe/liquid mechanisms may be new, but the puzzles display the same shocking lack of imagination as the rest of the game. As a result Trine 2 really is left to fall back on its paradigm of stacking boxes and planks to get over an obstacle, and while it was sometimes satisfying to overcome a puzzle through some particularly convoluted setup of boxes and planks it’s only because I specifically hadn’t solved it in the way the developers had intended. I could see what their solution would have been, in most cases, but it would have been tedious and boring and my way at least skipped a few steps. When the only fun to be had in a game is in metaphorically giving the level designers the finger, you know you have a problem. 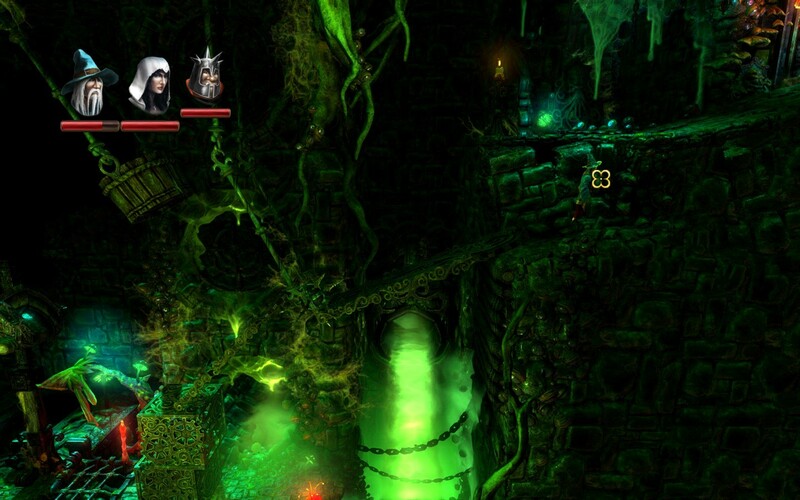 And there’s really very little else to recommend Trine 2. The game includes online co-op this time around but this simply breaks the game even further as you can now, e.g., have the wizard levitate a platform to boost the thief up and over something, which is something that wouldn’t fly in the single player game. Of course if your co-op partner is an EXPLETIVE DELETED who won’t give up control of the thief (hi Kenti!) the second player then has to get over the obstacle all on their lonesome making it more of a symbolic breaking than anything else, but not adapting the game to cope with two players in any way is more than a little bit of a design flaw. The rudimentary levelling aspect of the original has been expanded somewhat, but this is just so that the developers can put in barriers that are entirely dependent on your having the relevant ability in order to break them. Come up on a crackly stone wall without any points put into explosive arrows and you’re never going to get at the precious, precious experience vials locked behind it. The combat is complete garbage and may as well not be in the game since it basically consists of “Goblins are attac- oh wait they’re all dead, may as well get on with the box stacking.” The same goes for the story. The level backdrops are nice, I suppose, but they’re the same sort of nice you’d see in an art gallery – achingly two-dimensional and locked away behind an impenetrable barrier. Those backdrops looked way more interesting than the horrible, horrible levels I was slogging through, but I was never going to get to visit them. Possibly the worst thing about Trine 2 is that it is the same game as the original – which, let us remember, couldn’t even sustain itself over its four hour length and got utterly dire towards the end – but it’s half as long again. By the three hour mark I was looking at my watch wondering when the game was going to get to the point. Towards the end I’d gotten to the point where I just didn’t want to play it any more, completion be damned. It’s reasonably diverting for the first hour or so, but its staid, repetitive gameplay begins to drag on your spirits far quicker than it did in the first game and it eventually turns into an elaborate form of torture; I can easily believe there’s a circle of hell where the inhabitants are forced to drag around boxes and planks to get over an obstacle for all eternity. 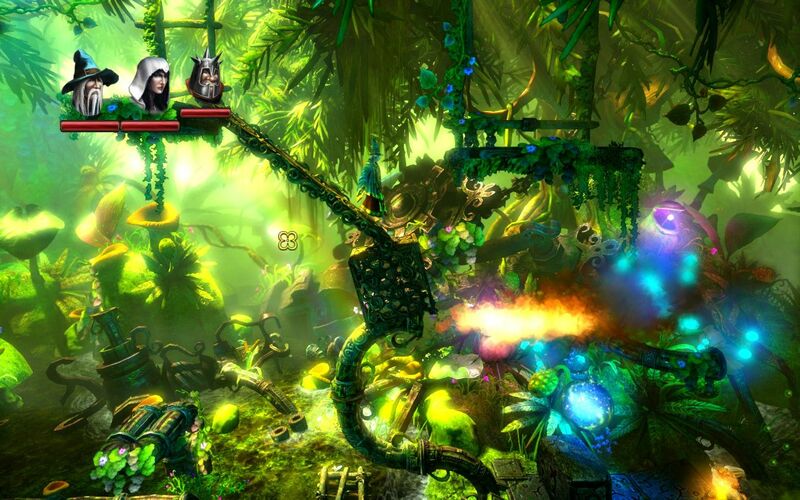 Trine 2 only lasts six hours, but it seemed twice as long. I really didn’t enjoy it.